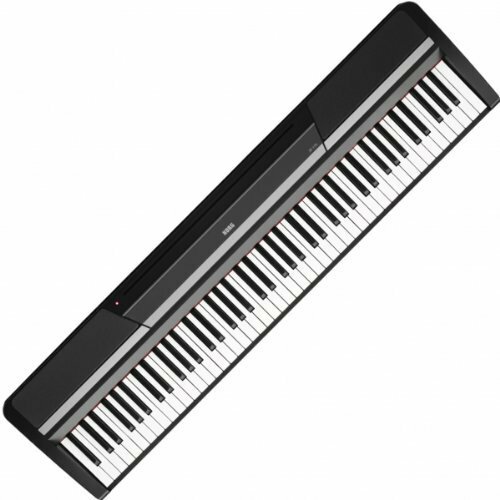 Korg SP170s Review - Is this keyboard wothy for your money? Time for a Korg SP170s review. Budget minded buyers might find plenty to like about this keyboard. But a wallet friendly price tag can’t be all that you look for in a piano, right? Musicians of every budget deserve the best that their money can buy. The question we gather here to answer today is if the Korg is just such a keyboard. As is true with all instruments, there is no simple answer to that question. Our goal today is not to tell you to buy the Korg, or to pass on it. It’s to help you see the pros and the cons, and decide for yourself. That in mind read on for our Korg SP170s review. It’s time to dive into some key features. Everything that you will find below reflects qualities that we appreciated in this board. Keyboards can get a little bit complex. If you are just looking to play the piano, navigating through a system of sliders and knobs can feel very overwhelming. The nice thing here is that that really won’t be an issue. They kept the interface pretty bare bones with this one. There is a simple mechanism for navigating the systems tones. There is also a button that will immediately bring you back to the default sound. That way if you get lost in the features, there is an easy way to come back to your preferred setting. Naturally, there is an unfortunate flip side to simple interfaces. Basic designs often reflect a basic range of features. We do see that here, though for the price that shouldn’t be surprising. The sound library is, admittedly a little modest compared to other keyboards. You get ten different tones. There are some boards that feature several hundred. The ten that we see here do deliver though. You get several different piano tones to chose from, which is always nice. You also get seven other sounds ranging from string instruments to drums. With a sound library range of this size, the purpose isn’t really to create music (though if you are creative you absolutely still can). The purpose is really just to give users a space to play around and have fun in. To that end, the SP170s’s sound library is very successful. Last, but not least you also get weighted graded keys. The benefit of having a key that is weighted is pretty simple. This just means that it is going to feature a level of resistance similar to that of an acoustic. It makes transiting between acoustic and electric very simple. Graded keys are even better yet. When keys are graded, it means that their weight reflects their position on the board. For example, lower notes weigh more than higher notes. The grading system is not extremely sophisticated here. Korg basically split the board up into three parts. The lowest notes weigh the most, the middle of the board is pretty moderate, and the high notes are quite light. Key grading can be a little bit more calibrated than that, but the effort still does have value. As we look now to the issues there is something that you should keep in mind: this product’s price. Keyboards in this price range usually have a few cons that just come with the territory. We see those cons here. This is worth mention because if you want something without these issues, you will need to build that into your budget. This said the problems were not insurmountable. One issue we had was with the keyboard. The keys are weighted, which is nice. The weighting is not quite as accurate as we sometimes see with better pianos, but it works. The problem is the feel of the keys themselves. The covering is very plasticky. This leaves the user with no doubt that they are playing an electric keyboard. For some people, this is not going to be a problem. Others might not care so much for this issue. Why? The gold standard for keyboards is to feel as much like an acoustic as possible. The Korg is not extremely successful at that. If this doesn’t matter much to you, great. If you want something with a better feel, you will need to look elsewhere. The other issue is the sound quality itself. The sound isn’t disastrous. The untrained ear might not even notice any problems. What the tones lack is nuance. Subtle notes and sophisticated playing aren’t going to register as thoroughly on this keyboard. That’s just not what it was built for. Finally, we also weren’t thrilled with the damper pedal that comes with it. This is a single pedalboard and said single peddle does leave something to be desired. We found that it felt flimsy, and not nearly as responsive as we hope to see. You can probably upgrade to a more suitable model, but who wants to have to do that? These things aside, it is a good keyboard with a competitive price tag. You’ve done all of your homework (reading this review) but now one important question remains. Do the pros outweigh the cons? Fortunately, there is one very simple way to find out. Read on for some pros and cons! The SP170s does offer customers with a limited spending capacity a high-quality option. Is it perfect? No. Of course it isn’t. Even the best keyboards aren’t quite perfect. But what Makes this keyboard special is that it excels in more ways than it falters. The simple, comfortable design will not be for everyone. In fact, we can pretty much guarantee that experts are going to want to find something else. However, if you are a beginner or even someone of a moderate skill level, we think you will find plenty to like here.